If you in the office right now, stop reading this for a moment, pop your head up and look around. I want you to count how many of your colleagues are women? If the current stats hold true there should be 1 woman for every 5 guys. That’s bang on in my office and I work for a company that has a good track record in maintaining a diverse workforce. One in five not only sounds like every party I went to as a teenager but scarily it was actually higher than I expected, a lot higher. I’m confident that, through a decade of programming, all the conferences I have attended, user groups I go to, I can count the number of female developers I have met and/or worked with on my hands and toes. Certainly, that won’t be the same for a lot of you reading this and thats great. Unfortunately the stats show I’m not only being too antisocial. There is a universal preconception that programming is full of beardy, nerdy men. Being honest, that’s not far away from the real truth. We are currently working in a community which unfortunately enforces a stereotype. The more this stereotype spreads outside our community, into family homes, schools, universities and workplaces the higher the barrier to entry is for people not holding the male membership card. If we look outside programming into the very world we live in, almost everything we see, consume, and take pride in are products of the diverse eco-system. From medicines stemming from a the isolation of wild organisms to the very livestock and crops derived from a wild ancestry. It is the niche differences in the melting pot that brings a richer more sustainable environment for all. I know the vast majority of you would never discriminate against a fellow developer. Most small business employers only care about the best person for the job where they come from or their gender is purely coincedental. That is certainly my experience, maybe I’ve been lucky and only worked with great devs and sensible employers. But one thing is clear: The community needs a booster shot to make it a more welcoming and attractive place for all. Sticking with the female programmers, there is a clear lack of women getting into our industry. It’s the simple truth of the matter. The reasons why are many and for most of us guys, completely alien. But what do we do about it? Well, you could have a drama, you could listen, apologize or you can support one of the great organizations bringing Ruby and Rails to women from all walks of life. I’m talking organizations like RailsBridge, RailsGirls, and InstallFest. I’m very fortunate to have seen first hand the sheer enthusiasm events like these can instill. They are not focused on being female only, experienced male developers are encouraged to support these events by volunteering their time and knowledge to assist in delivering the syllabus and supporting the delegates. My far better half attended a RailsBridge along with a female colleague (our 1 in 5) and as a consequence have carried on learning, questioning and growing as developers. By connecting me to a diverse community, RailsBridge expanded my conception of who can be a programmer. At the same time, it gave me a place to start learning, and a path to continue learning after I mastered the formal curriculum. The community has continued to offer opportunities to learn more, to develop new curricula, and to contribute to open source! 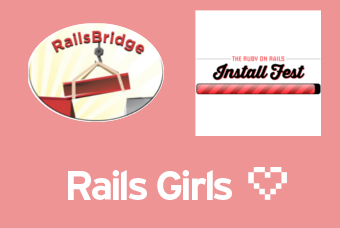 RailsBridge began as a narrow effort to bring more women to the San Francisco Ruby community. Our strategy is to offer workshops where people who are usually in the minority in programming communities are in the majority for the day. Now we’re expanding beyond San Francisco to improve overall diversity in tech, specifically focusing on the open source community! To date we’ve formed 14 chapters in the U.S. and Canada, and we’ve held workshops around the world including Capetown, South Africa. We work with other organizations that promote diveristy in tech, including the San Francisco group Black Founders and the Mexican women coders organization, Codificadas. We also partner with regional Ruby and Rails conferences to help increase the diversity of the Ruby community all over the world. From the RailsGirls, co-founder Linda Liukas really places an emphasis on creating the most conducive environment for diversity to thrive. The InstallFest from reInteractive, based in Australia, have taken a similar approach and encompass all genders to create a kick start for those interested, or begin their paths as programmers. The general sentiments are the same, by providing a comfortable, conducive environment, removing preconceptions and barriers groups like these are infusing diversity into the Ruby community, helping to make it that thriving sustainable ecosystem we all want one student at a time. It’s fantastic that the Ruby community has people who care that much about diversity. They don’t just care, they get of their duff and go out and do something about it. I remember after the whole Brit Ruby fiasco, there was a bit of bad feeling and some dropping out the community altogether. It was really sad for so many different reasons. One of the things I love most about these workshops is, once a student has completed the syllabus, they teach that syllabus to the new faces. What better incentive is there for a potential new dev to work with someone who not that long ago sat in their positions with the same questions and reservations? The Ruby community is pretty fantastic. Of course, it has it’s downsides, but what family doesn’t have those crazy uncles? In the real world away from Twitter and Hacker News, the people are passionate, inclusive, and willing to enable anyone regardless of gender or nationality. We are almost militant about diversity. We have the tools, the passion, and the people to continue to build a community that benefits all members.